The U.S. Centers for Medicare & Medicaid Services (CMS) has officially adopted the 2012 edition of NFPA 101®: Life Safety Code®. This new six-part online training series lets you work at your own pace to learn how to keep your facility in compliance. 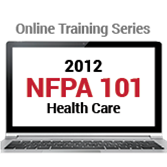 Developed expressly for the health care communities, the interactive new self-guided NFPA 101: Life Safety Code for Health Care Online Training Series provides convenient, online instruction on how to navigate and implement the 2012 edition of NFPA 101 -- now officially adopted by CMS. Health care facility managers, safety directors, AHJs, code consultants, and others will gain important knowledge about the changes and some of the newly introduced provisions in this edition of the Code. NFPA® provides effective online training in a flexible, affordable, and relevant format. Developed by leading Code experts, six courses provide a dynamic learning experience that will help you succeed in ensuring your facility is meeting the standard of care required by the 2012 edition of NFPA 101. Interactive exercises and job aids impart information, allow practice, and reinforce learning once you've returned to the workplace. Each one-hour course ends with an exam to test your knowledge. Completion of modules 1-3 is recommended before moving on to modules 4-6. The U.S. Centers for Medicare & Medicaid Services (CMS) has officially adopted the 2012 edition of NFPA 101: Life Safety Code. The General Requirements online course lets you work at your own pace to learn how to keep your facility in compliance. The first essential course in the interactive new self-guided NFPA 101: Life Safety Code for Health Care Online Training Series focuses on the Code's general requirements related to hospitals and nursing homes. The General Requirements course provides a necessary overview for health care facility managers, safety directors, and anyone concerned with the changes and some of the newly introduced provisions in the 2012 edition of NFPA 101. Working at your own pace, you'll learn about the Code's intent and organization, including how to navigate core chapters, occupancy classifications, and Annexes. Interactive exercises and job aids impart information, allow practice, and reinforce learning once you've returned to the workplace. The one-hour course ends with an exam to test your knowledge. The U.S. Centers for Medicare & Medicaid Services (CMS) has officially adopted the 2012 edition of NFPA 101: Life Safety Code. The Egress Basics online course lets you work at your own pace to learn how to keep your facility in compliance. Course two in the interactive new self-guided NFPA 101: Life Safety Code for Health Care Online Training Series delves into means of egress and fire barrier provisions for hospitals and nursing homes. The Egress Components course provides a necessary overview for health care facility managers, safety directors, and anyone concerned with the changes and some of the newly introduced provisions in the 2012 edition of NFPA 101. Working online at a pace that's comfortable for you, you'll learn how the Code addresses means of egress, which provisions for fire barriers and fire doors and windows you must follow, how to apply provisions for stairs, and more. Interactive exercises and job aids impart information, allow practice, and reinforce learning. The one-hour course ends with an exam to test your knowledge. The U.S. Centers for Medicare & Medicaid Services (CMS) has officially adopted the 2012 edition of NFPA 101: Life Safety Code. The Egress: Capacity, Number, and Visibility online course lets you work at your own pace to learn how to keep your facility in compliance. The third course in the interactive new self-guided NFPA 101: Life Safety Code for Health Care Online Training Series teaches you how to determine occupant load factors in the health care environment. Online lessons in the Egress: Capacity, Number, and Visibility course deliver must-have training for health care facility managers, safety directors, and other professionals who want to learn about the changes and some of the newly introduced provisions in the 2012 edition of NFPA 101. You'll learn the five steps for calculating capacity; how to determine if egress capacity is sufficient; and about requirements for lighting, illumination, and egress markings. Interactive exercises and job aids impart information, allow practice, and reinforce learning. The one-hour course ends with an exam to test your knowledge. The U.S. Centers for Medicare & Medicaid Services (CMS) has officially adopted the 2012 edition of NFPA 101: Life Safety Code. The Means of Egress and Special Health Care Egress Considerations online course lets you work at your own pace to learn how to keep your facility in compliance. Developed by Code experts, this self-guided course in the NFPA 101: Life Safety Code for Health Care Online Training Series clarifies and explains special considerations for egress in the health care environment. Online lessons in Means of Egress and Special Health Care Egress Considerations provides key training on the changes and new requirements included in the 2012 edition of the Life Safety Code. Working online at your own pace, you'll learn about egress arrangement and how to identify common paths of travel, which method to regulate travel distance applies to health care occupancies, how to apply concepts of accessible means of egress, and much more. Interactive exercises and job aids impart information, allow practice, and reinforce learning. The one-hour course ends with an exam to test your knowledge. The U.S. Centers for Medicare & Medicaid Services (CMS) has officially adopted the 2012 edition of NFPA 101: Life Safety Code. The Features of Fire Protection online course lets you work at your own pace to learn how to keep your facility in compliance. Another must-have course in the interactive new self-guided NFPA 101: Life Safety Code for Health Care Online Training Series, the Features of Fire Protection module focuses on requirements for protection in hospitals and nursing homes. The ability to correctly specify fire alarm and automatic sprinkler system requirements is vital for engineers, risk managers, and others concerned with learning about the new provisions in the 2012 edition of NFPA 101. Working online at a pace that's comfortable for you, you'll learn how the Code addresses vertical openings and hazardous areas, the requirements for corridors and smoke barriers, and more. Interactive exercises and job aids impart information, allow practice, and reinforce learning once you've returned to the workplace. The one-hour course ends with an exam to test your knowledge. The U.S. Centers for Medicare & Medicaid Services (CMS) has officially adopted the 2012 edition of NFPA 101: Life Safety Code. The Special Provisions and Operating Procedures online course lets you work at your own pace to learn how to keep your facility in compliance. Take the NFPA 101: Life Safety Code for Health Care Special Provisions and Operating Procedures training to learn how the 2012 Code addresses health care facility rehabilitation, and about occupancy-specific requirements for high-rises and special structures. This course also covers provisions for building services -- an essential subject area governed by the 2012 edition Life Safety Code. Working online at a pace that's comfortable for you, you'll learn how about Code requirements for building rehabilitation projects, utilities, HVAC, elevators, escalators, laundry chutes, and more. Provisions for evacuation drills and staff training are also discussed. Interactive exercises and job aids impart information, allow practice, and reinforce learning once you've returned to the workplace. The one-hour course ends with an exam to test your knowledge. View this FREE interactive demonstration of a 2012 NFPA 101®: Life Safety Code® for Health Care Series Online Training Series (2012) course!